Blue: Will the Upcoming Update to Windows 8 Change the Scene? It was a fine morning in January that 72 year old Tami Fletcher went to the Radioshack Store in Long Beach, New York and purchased an upgrade to her old laptop running Windows. She had a Dell laptop of nearly ten years old that was running Windows XP Media Center edition. In the recent times her applications and the Internet connection have been slowing down unnecessarily, and she was not able to display some web pages properly. A friend of hers suggested that she upgrade her laptop’s hardware and get the latest Windows. This was what drove her to Radioshack. When she got the laptop back after three days, with the necessary hardware upgrade and Windows 8, she was quite happy, until she reached home, turned on the laptop, and found herself wondering where all her stuff went. She was specifically told that none of her stuff would be lost in an upgrade, but she was looking at what was completely new to her. And there was no way old Tami could get herself acquainted with the new Windows. This is not a single incident. A difficult learning curve in getting around the new Windows 8 has been reported by millions of people, who purchased the upgrade from different parts of the world. Within the first six months of releasing Windows, it was purchased by over 100 million people, the same kind of attention and popularity as garnered by Windows 7. The problem began soon. Microsoft started receiving calls and messages regarding how absurd the new Windows operating system was and how difficult it was to learn to use it properly. This is one of the reasons why the Windows team is developing an update to the OS, right now codenamed Blue. Let’s check it out in detail. What Was Wrong With Windows 8? A huge number of popular features were removed from Windows 8 due to the fact that the operating system primarily supports Microsoft’s mobile user interface for Windows Phone and Windows RT. Microsoft wanted to have a unique user interface across all these different form factors, and that was the reason why they pushed Windows Phone’s Metro UI in Windows 8 for desktop as well. But that probably did not help the company out greatly. 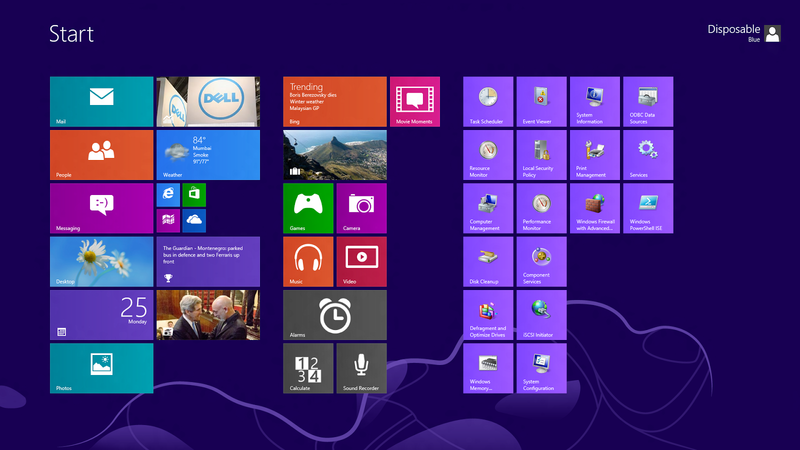 A brief look at the features missing on Windows 8 alone will convince you why people are bothered about this upgrade. One of the most important features missing in Windows 8 is the vintage Microsoft Start button. People really need this to feel at home in a Windows PC. While millions of users of this operating system are not technically savvy, they have grown accustomed to the familiar Windows interface that was retained even in Windows Vista and 7. While Windows 8 is perfect for touch interfaces, most people still want this OS to support a mouse and keyboard, and they want that Start button. When they don’t find it, they simply complain. Another feature missing is the Windows Media Center, which was provided as an add-on up until Windows 7. There are many old customers who are still using Media Center. The OS comes with a brand new user interface that many old customers find annoying. What Microsoft should have done from the beginning was to make the regular Windows desktop the primary part of the UI and then make the Metro an add-on. Many people flipped out looking at the new user interface and had no clue what they were looking at. This was to be expected. While mobile phones and tablets can have that different kind of UI, a desktop computer must have its familiar interface, or there will be backlash from everywhere. With that huge number of customer complaints and feedback, Microsoft realized that they made a mistake at least in the case of the desktop operating system. This was the motivation behind Windows’s upcoming update known as Blue. On March 26 , TechNet had a blog post by Frank X. Shaw, Corporate VP of Corporate Communications of Microsoft that Announced the existence of Blue. On May 6 , Microsoft’s Chief Marketing and Financial Officer to the Windows and Live division, Tami Reller made an announcement about the new developments to Windows 8. She said, “The learning curve is real and needs to be addressed.” This has been the first time that Microsoft has realized how important it is to satisfy the old customers, especially the ones who install Windows 8 on non-touch devices. The details were published by the Microsoft Windows blog by Brandon LeBlanc as an interview with Tami Reller. Microsoft did forget that huge customer base as soon as tablets and smartphones started encroaching into the PC market and pushed down the sales strongly. Windows Blue is a strategic upgrade to Windows 8. It has been known to address a few of the important issues that created widespread negative feedback from customers toward Windows 8. Although over 100 million licenses of it were sold, that makes up for only 3.8 percent of the overall PC market (click to enlarge). In the above blog post, it has been mentioned that over 2400 devices run Windows operating system. While most of the new devices (tablets and touch laptops) are touch-based (like HP Envy, Acer Iconia, and some others) , there are a huge number of regular PCs, including the ones that come with CRT monitors that cannot use touch capabilities of Windows 8. Hence, as a first step, Microsoft Blue will address the regular Windows interface on these devices. It should essentially push the regular Windows interface on non-touch devices and Metro UI to touch-based devices. This is an indication that the next update of Windows 8 may include a way to boot directly to the regular desktop mode rather than the tiled Metro UI. One of the major complaints from users was that there was no way for them to boot to the regular desktop mode as in Windows 7. With Blue, if this gets fixed, people may like the OS more. Microsoft is gearing up toward the Build conference in June, between June 25 and June 28 , in the Moscone Center, San Francisco. It is expected to be in this conference that more details of Windows Blue will be made available. Three important aspects that Tami Reller has mentioned that Microsoft Blue will address are the touch interface, addressing feedback from customers, and new form factors. One thing Blue will incorporate is the ability to resize the tiles in the Metro interface. Tiles can be made as small as one fourth or as large as fourth their original size. The customization tools also include ways to change color, looks and other properties of tiles. These enhancements could make the tiled interface friendlier in touch-based systems. Windows, although is available on smartphones and large tablets, has not yet addressed small tablets in the 7-inch range, dominated by Apple iPad Mini, Google Nexus 7, and Amazon Kindle Fire. With Blue, it is expected that this flaw may be addressed. Support for ReFS (Resilient File System), Miracast (a Wi-Fi method to screencast), NVM Host Controller Interface (a way to standardize the device drivers for SSDs, Solid State Drives), Universal Flash Storage. Apps and updates: Internet Explorer 11, calculator, alarm clock, sound recorder, file manager, and video editor. More options in the Control Panel and PC settings. The start screen has been revamped to include: more color options, size options, ability to lock tiles in place, ‘all apps’ section, etc. Something called kiosk mode in which the entire device can be made into a metro app. Better integration to SkyDrive, more syncing settings with other devices, and more options in Bluetooth keyboards and mice. As you can see, there are a huge number of updates and improvements expected in Blue. If these developments change Windows user experience in a positive way, there will be hope for Windows desktop operating system. It was proclaimed early in the year that Windows 8 surpassed 60 million sales across all-in-ones, PCs, laptops, and tablets. A few days ago, that number reached 100 million licenses. In the PC marketplace, Windows stands out as the biggest operating system. However, this is one of the major reasons why Microsoft cannot sell large user interface modifications to the operating system. That move will only alienate users from their familiar operating system, especially since a huge user base of Windows consists of non-techie customers. With Blue and further developments in Windows 8, Microsoft may probably be able to turn the tablet and tablet PC industry in its favor. We will gather more information and update as necessary. Lumia 928: Probably Verizon’s New Hero!